WHY ARE ALL MAREMMAS NOT THE SAME? Having now looked at the special characteristics that make a livestock guardian, we must understand that not every pure bred livestock guardian puppy will behave the same way as the next. This is due to individual base personalities that your dog possesses. Just as people are all born with base personalities, so are dogs. In the situation of running a pack of livestock guardians, in fact these personality types provide a well rounded guarding situation. We have all heard the saying that too many cooks spoil the broth. How well would it work if you had 5 livestock guardian dogs and all of them insisted on leaving the herd every morning to do the fence rounds and mark 100 acres of territory? Any predator watching this behaviour for some days would soon learn that the herd is not protected for an amount of time each day. 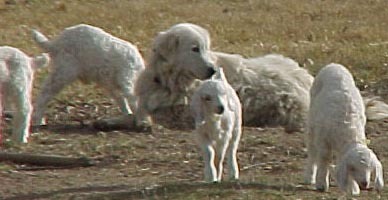 In fact there are a few key behaviours that differ amongst maremmas that are discussed here, and having a range of personality types in your livestock guarding dogs will give you the most effectively protected herd. One of the most important points in this is you cannot buy a young puppy and expect that it will grow up to become the perfect guardian alone. It is true if you have a very small property, a low level of predator activity, and only a handful of livestock, a single dog may be sufficient. 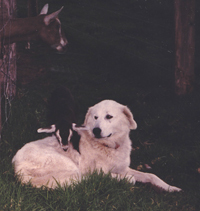 However in most farming situations you need 2 or more livestock guardians. How can a single dog be expected to handle an attack from a pack of dogs anyway? Please note that effective guarding behaviours that have been discussed here have no link to hormones, and therefore have no link to the gender of the dog. NEUTERED livestock guardians are actually the most effective guardians as they are never distracted by the call of nature to breed. This dog is the one that normally conducts the boundary marking and is often the first to be heard barking. What is interesting however when you have a pack of maremmas guarding is that you will often notice that one maremma does most of the territory barking marking during the day, whilst another does this more in the night. A pack will split the duties to achieve the highest protection for your herd whilst conserving energy for the pack most efficiently. This dog is most often seen loafing amongst the herd. When young are born in the herd, you will find this dog always seems to have them around, they seem to attract young livestock. When one of the scouts or the alpha begins a warning bark, the herd will quickly move towards this dog (if you have a large pack of guardians you will likely have several of these dogs). If the threat seems to be quite real and predators are in the area, this dog will begin to lead the pack to a safer area so the other dogs can deal with the threat. I don't think the role of this type of guardian can be underestimated! This dog does not so much mark the perimeters of the territory as they scout. If the livestock are moving, the scout dogs will go ahead and out to the sides ensuring that the livestock only move to safe areas. Depending on the size of the herd and property they can seem to range over quite wide areas, following scents and noises they perceive to ensure safety. One of the biggest problems with attempting to have a single livestock guardian is that no one of these personality types alone can give true protection. An alpha guardian will give the best protection on its own, however if you have a large property, they will leave the herd to mark boundaries, having to judge the safest time of day to perform this duty. Still, remember if you have packs of predators, no single guardian can protect on its own. A single nursemaid guardian is more concerned with leading the herd away from danger and looking after young, old or ill livestock. This type of dog on its own is perceived as not being protective enough. A scout guardian is the one that gets itself into trouble for wandering and is perceived as not being attentive to its herd. Unfortunately you cannot be sure when choosing a puppy which personality type it will possess, however there is further information on puppy behaviour differences to assist you.